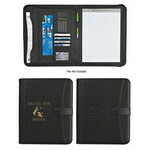 Get your brand noticed with personalized zippered folders, customized with your business logo. Promotion Pros' zippered notebooks are made from the highest quality materials to ensure long-term brand visibility. Our promotional binders with zippers are ideal for swag tables at business expos so visitors know exactly who you are and what your company is about. We carry conference ring folios, portfolios with calculators, metro calculator padfolio and more, so you're guaranteed to find what you're searching for. This executive ring folio binder includes a writing pad with matching privacy cover and is an ideal branded gift for employees and customers. 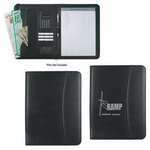 The Leather Look 8 ½" x 11" Zippered Portfolio with Calculator is functional, sleek and elegant. It includes a 30 page 8 ½" x 11" writing pad with a calculator. The Pebble Grain Portfolio 8 ½" x 11" Zippered Portfolio with Calculator is functional, smooth and elegant. It includes a 30 page 8 ½" x 11" writing pad with a snap closure. The junior simulated leather padfolio features a 5" x 7" writing pad with matching privacy cover, making it a great company gift. The metro calculator padfolio has one file pocket, two CD pockets, two business card holder pockets and makes an ideal gift for loyal clients. Help your clients carry their papers around, while they're on the go, with the Oregon Canyon Leather Zip Around Meeting Folder. This letter-size zip-around meeting folder has a double zipper for easy access and includes plenty of pockets for credit and business cards, calculator, and pens. The ultrahide protech padfolio has a gusseted file pocket, two CD pockets, business card holder and makes a great corporate gift.